In 2017 Mexican vehicle production increased 13% to more than four million units, according to the International Organization of Motor Vehicle Manufacturers OICA. Exports increased 12% in 2017 and 10% in H1 of 2018, helped by new production plants. That said, domestic market sales remained subdued in H1 of 2018 (also due to higher fuel prices). Profit margins of OEMs and Tier 1 suppliers are expected to remain stable, as Mexico imports only 10% of car parts used by assembly companies, and therefore an immediate effect of punitive tariffs on steel and aluminium is not expected. In addition, many car parts producers (often subsidiaries of global groups) have hedged against price volatility. The average payment duration in the Mexican automotive industry is between 30 days and 90 days. Payment behaviour in this sector has been stable over the past two years. The number of non-payments and insolvency cases is not above average compared to other industries, and it is expected that there will be no deterioration in the coming months, given that the businesses environment remains stable. 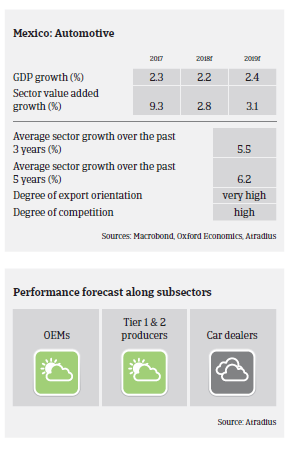 Our underwriting stance remains open for vehicle manufacturers and Tier 1suppliers, given the strengths of most businesses in this segment (well established, often part of global company, high investments made). For Tier 2 suppliers our underwriting stance is more neutral, as this segment is more susceptible to changes in commodity prices and to price competition. It is expected that foreign investment into manufacturing and supply will continue; further strengthening the sector.